“Prince William will spend $60,000 for a study to look at the Rural Crescent, the Board of County Supervisors decided unanimously Tuesday. 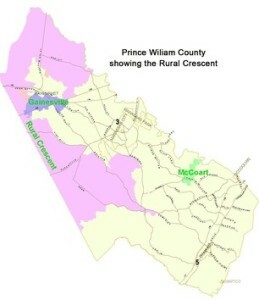 “The study, which will be farmed out to a consultant by the county planning office, will look at the a controversial crescent-shaped slice of land created in 1998 in western Prince William that is zoned for low-density housing. The study will be aimed at identifying preservation tools and determining if the current land use designation for the Rural Crescent – one home per 10 acres – is appropriate. “The study is estimated to take a year to complete. “The board also voted to spend $75,000 for consultants to prepare guidelines for the Potomac Communities Design. Located along the U.S. 1 corridor, the Potomac Communities is home to a mature business and residential community, much of which has fallen on hard times. “Planning Director Chris Price said Potomac Communities is ripe for redevelopment and that this study could go a long way in identifying ways to do that. “Woodbridge Supervisor Frank J. Principi said he would have liked to have seen these studies come before the board during the budget process. He also asked whether it would’ve been better to hire a full-time employee to help the county do this study in-house. “County Executive Melissa Peacor said she would rather spend this money on experts in a one-time fashion instead of adding county staff. The funding for these studies will be coming from the contingency reserve, which is funded with $500,000 each year. “According to Peacor, the contingency fund is perfect for matching grant opportunities and consulting opportunities like the ones approved Tuesday.